Most of us face major issues when it comes to charging phones especially when we are commuting to work, travelling a long distance, going to distant meetings. It can be quite inconvenient if the mobile phone goes out of juice and batter goes down, and you don’t have the charging port. In such precarious situation, a good power bank can provide the much-needed solution of charging woes. But finding the right power bank is quite tough. There are various factors associated with it that need to be considered and not to mention its brand as there are many low-quality power banks available in the market from non-established, cheap companies. Philips is a well-known name when it comes to consumer electronics, and its latest power bank provides just the right solution to mitigate the charging problem of mobile phones. Its latest offering is Philips Power Bank 13000mAH. It is a premium quality power bank which fulfils all your charging requirements with its phenomenal features and qualities. Talking about its appearance and build quality, it is a sleek, sturdy and attractive power bank made of plastic. It weighs merely 299 gm which means you can easily take it anywhere without feeling the excess weight which often occurs in other power banks which are bulky and heavy. Enhanced Capacity – It is measured at 13000 mAh which basically means it has high storage amount. It has great efficiency. On an average, a power bank has 70% efficiency. In case of this power bank, the efficiency is higher. I charged my smartphone with a battery size of 2000mAh with this 13000mAh power bank, I got 5 full charges, and it still had some juice left. It shows how efficient this power bank is. Fast Input- Owing to its micro USB 5V/2A input, it charges quite swiftly. This essentially means that the power bank charges in considerably less time than its competitors and provide you with the flexibility to move with little time spent on recharging the power bank. Maximum Output – When it comes to the output of this power bank it offers 5V/2.1A. Since it has higher capacity charging, it can charge multiple devices at the same time. If your Smartphone requires 1A, then a power bank with a 2.1A Max output would be sufficient. If you were then to plug in your tablet which requires 2.1A, the 2.1A would be shared, and the recharge time would take longer. Safety Systems- It provides great protection against short-circuits, over-current as well as overloads. This feature provides the safety of the power bank as well as your charging device. Pass-through charge technology – This feature allows you to charge your device while the power bank is getting recharged. This is a great feature which provides convenience and comfort to the user. We found it extremely useful as we charged our two devices while the power bank was charging. Dual Output- Since it has two USB output, it provides you with the ability to charge two devices at once which means you can charge your smartphone and a tablet or other smartphone, simultaneously. Premium Battery Quality- When it comes to battery quality, the power bank should have a consistent performing battery which does not cause any issues. This power bank has standardized Lithium Ion battery which is quite reliable and highly durable. Build Quality- It is made up of high-quality plastic which is sturdy and appealing. It has good grip and does not leave smudges on the surface where the power bank is put on. Accessories- It comes with a one premium quality USB cable which withstands strenuous handling without any issues. Compatibility- This power bank is compatible with a smartphone from Sony, Samsung, MIcromax, Lenovo, Motorola, Vivo and iOS devices like iPhone, iPad and iPod. Power banks have become an essential part of travelling and busy individuals who do not get chance to constantly charge their phones or other devices like tablets, due to unavailability of charging points. Philips Power Bank 13000mAh is a premium quality power bank which offers a plethora of features that you expect from a product of a top-rated company. It offers great charging facilities and options, with multiple device charging. It has fast input and great output to facilitate easy charging and charging, respectively. It has built-in safety features which not only saves the power bank but also your devices. Its build quality is best in class with the most appealing look. It is compatible with devices from different leading companies. It comes with a standardized Lithium battery which makes it a reliable power bank. All-in-all it is a feature-rich and power-packed device which will bring convenience to you. 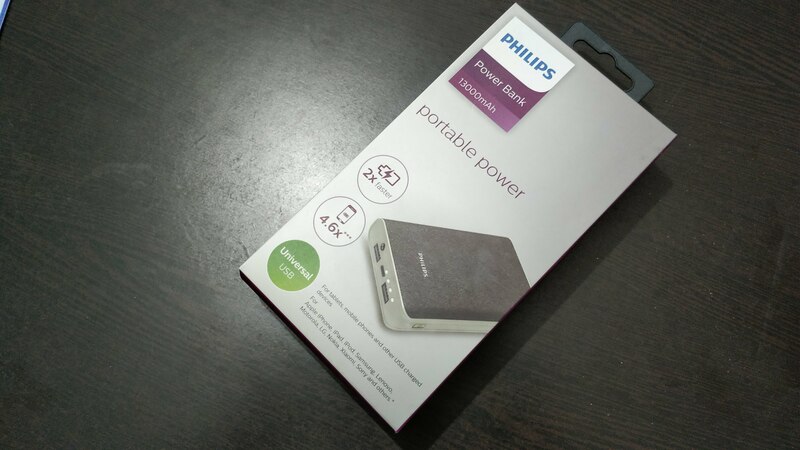 With this, we wrap up our review of Philips Power Bank 13000mAh. If you use this product and wish to express your reviews and opinions, mention them in the comment section below.